LRC had the great pleasure of creating the master plan below. This subject parcel is over six hundred (600) acres in Windsor, Connecticut, and is currently owned by ABB who was actively soliciting bids to joint venture the property with a developer. LRC was asked to create a multi-use layout consisting of an industrial component, two separate office components and a multi-family residential component—all while maintaining a significant portion of the existing facility already on site. The industrial tenant anticipated for this site is an international bottler, I.e. Pepsi Co., requiring an extremely large bottling facility. The office space design for the site consists of one 450,000 s.f. to 500,000 s.f. single user and another series of free standing three story buildings of 150,000 s.f. that could be phased in construction. 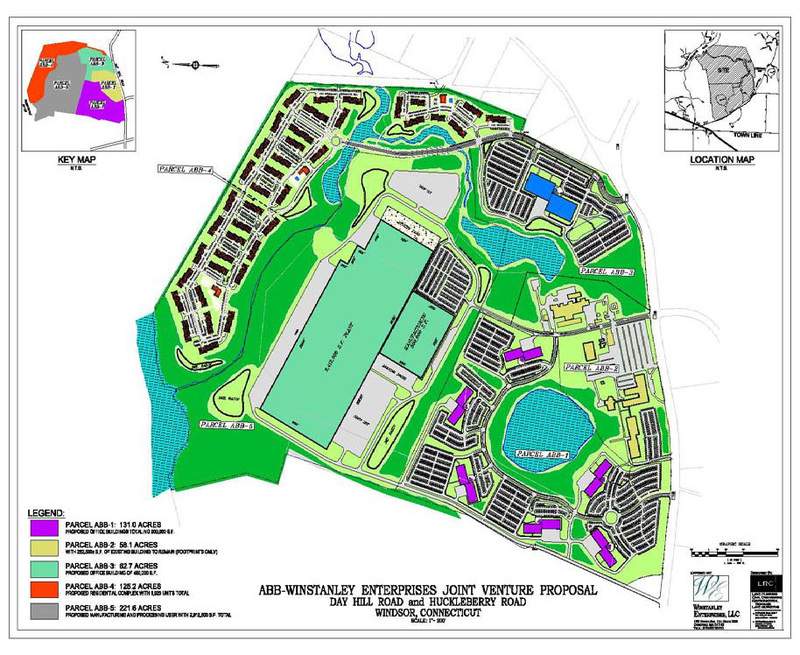 The residential component for the site envisioned an attached condominium development of almost 2,000 units. This master plan generated by LRC greatly assisted the client’s selection as the joint venture development partner by ABB.